I used to have a different bottle of cleaner for everything in our house. We had a lot of bottles. I really began to dislike the chemically smells they gave off. Sometimes they would give me headaches. I did not like how much space they took up. I despised the childproof lock on my bathroom cabinet that I had to keep on because I read all the fine print warnings on the cleaning bottles. So one day I just threw them all in the trash, along with the childproof lock. We went to Costo and bought a large bag of baking soda and 5 litres of vinegar. Essential oils get rid of the vinegary smell. Cleaning has become much easier and no, I don't miss any of those commercial cleaners. It really is true that many times, less is more. Here is a link with recipes to try. I read about people making their own laundry detergent. It seemed pretty simple and I like simple. My large Costo supply of laundry detergent just ran out so it was time to give it a try. We followed a recipe off of here. We put our soap in the microwave just long enough to dry it out so it would crumble before putting it in the food processor. Our Zote soap after a run through the food processor. 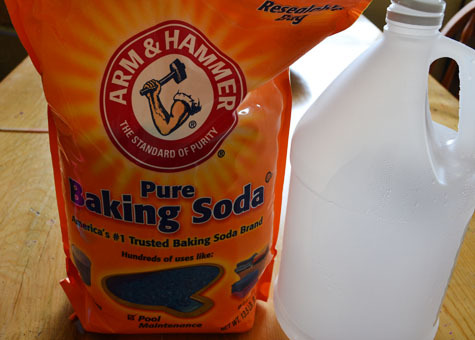 After that we just mixed it with Borax and Washing Soda. I did spend an extra 2 minutes running it through my food processor one last time because I wanted it to be super fine. Easy peasy. We also picked some lavender and lemons out of our garden that we are going to soak for 6 weeks to use to make linen spray and scent our vinegar cleaning solution.